The Galerie ARTcadienne in Miramichi presents a new exhibition with the passionate artist, Denise Paquette, illustrator of children’s books. The exhibition opens on Thursday, October 30th and runs until Sunday, November 30th, 2014. 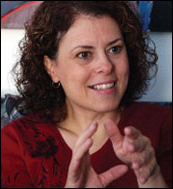 Denise Paquette studied visual arts at regional Cegep of Lanaudière in Joliette, Quebec, literature at the Université de Moncton, then narratology at Université de Laval, Quebec. She taught French and technical writing at the University. She was also a research assistant and project manager in oral history, a cultural and literary columnist, editor, proofreader and freelance illustrator. In 1989, she published at the Éditions d’Acadie, Une promenade en girafle, the first children’s book in a series of three featuring Souris Baline. Since then, Denise has written and illustrated nearly 40 books for children: Gribouillis barbares and Annie a deux mamans (Bouton d’Or Acadie, 1999 and 2003), finalists for the Hackmatack Prize, an Atlantic Canadian Book Award chosen by children. Her illustrations have been exhibited at Coin des arts at Concordia University, Galerie 12, Acadian Museum and the Art Gallery at Université de Moncton. In 2000, Denise Paquette, with the collaboration of the illustrator Denise Bourgeois, launched a new collection Léa et Laurent, at the Bouton d’or Acadie publisher, with a first title La terre à aimer. The series theme is nature on land, sea and river. One goal of the author is to enable young people to learn new words. Thus, while telling a story, she often uses rhyme and repetition. The Galerie Artcadienne is open 7 days a week and admission is free. Visiting hours during the week are from 8 am to 10 pm and on the weekend from 9 am to 5 pm. The Galerie is located at 300 Beaverbrook Road in Miramichi. For information telephone 506.627.4125.